Fairtrade Fortnight is coming to an end, but you still have a chance to “choose products that save lives”. Take a look at last week’s post to find out more on why buying fairtrade chocolate helps growers in poorer parts of the world. To celebrate Fairtrade Fortnight, I have a giveaway for four 85g bars of Seed and Bean chocolate. Seed and Bean is a company founded on ethical principles and all of its products are not only Fairtrade and organic, but taste good too. I’m a fan. The 18 flavours offered are interesting and the packaging is attractive and captures my attention every time. You can see more detail about some of their chocolate bars in previous reviews, the last one of which was a rainbow of delight. This time I was sent a bar of their award winning Sicilian Hazelnut & Almond (37%) which is pure delight. It’s a milky gianduja, which is smooth, creamy and not too sweet. It has an aroma of roasted hazelnuts and a taste of Italian sophistication. I meant to try just a little bit and before I knew it the whole bar had disappeared – how did that happen? The dark (58%) Lemon and Cardamom was also a new one on me and I’m quite enthralled by it. Like all of the Seed and Bean chocolate I’ve tried, the flavours are subtle, but they are most definitely present. Lemon and cardamom are closely aligned in flavour, yet complement each other well. I used this chocolate to top my lemon coconut cakes. I was intrigued to find out what the Tangerine milk chocolate bar (37%) was like as I thought it would be hard to differentiate the flavour from that of orange. The scent of citrus was there and extraordinarly it really did taste of tangerines, not oranges. It is, in fact, quite a delicious bar. The fourth one in the pack is another milk chocolate one, Cornish Sea Salt & Lime (37%). This is a firm favourite of mine which I have reviewed before. Since writing that review, Seed and Bean have, much to my delight, upped the cocoa content of their chocolate. I’m hoping they will up it again at some point as a higher cocoa content makes for a richer and less sweet chocolate. In my world, all milk chocolate would have a minimum of 40%. I was also sent an additional bar of dark Espresso (58%), but this is NOT part of the giveaway. I haven’t tried it yet, but I’m thinking CT will be much enamoured. Seed and Bean are offering a 20% discount on all orders during Fairtrade Fortnight, but do hurry as this ends on 8 March. 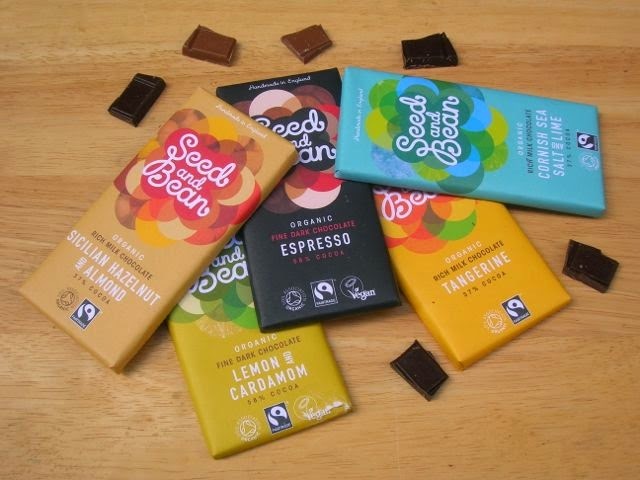 Seed and Bean has kindly agreed to give one of my readers four bars of their 85g chocolate bars as described above. To be in with a chance of winning, please fill in the Gleam widget below. You will need to leave a comment on this post, answering the question, which then gives you additional chances to enter if you so wish. Gleam will pick a winner at random from the entries received. If you are commenting anonymously, please give me some way of identifying you as I will be verifying the validity of entries. Any automated entries will be disqualified. This giveaway is only open to those with a UK postal address. Winners will need to respond within 7 days of being contacted. Failure to do this may result in another winner being picked. Prizes are offered and provided by Seed and Bean and Chocolate Log Blog accepts no responsibility for the acts or defaults of said third party. What a fab giveaway Choclette! Thanks Karen, the chocolate sure is good. Lemon and cardamon sounds really exciting! I think dates go really well with chocolate, but I’ve never seen a bar with dates in. I’ve added it to The Food Blog Diary for you. Cornish Sea Salt & Lime sounds wonderful!! I’d love to see a chili flavor! Rich Milk would be tasty. I would love to give these to my “bestie”! I have not tried any of these chocolate flavours so would be great to win and see what they taste like! They do have some very interesting flavours! I would like to see something with freeze dried raspberries maybe? Date & Walnut or Maple Pecan would be great additions to the range. coconut and pineapple in dark choc! wow they sound lovely. maybe a peanut butter one? Salted caramel looks lush, but I wouldn’t say no to any of them! Hi! Thanks – I clicked on the name of the prize and that seemed to work. I would love a cherry and dark chocolate one! Which existing flavour? White Poppy and Lemon – I’d love to try this one. Great giveaway – and I LOVE your name! Can’t see a Gleam widget in any browser on two different computers, has this ended? No it’s still live William. If you click the link at the bottom of the post, it will take you to gleam. I know one already has cardamom…but I’d say rose and cardamom, as it’s one of my favourite flavour combinations! Ooh now that does sound good Emily and not one I’ve tried. All the flavours sound very moreish. Tangerine is one I’ve never heard of which sounds yummy! Salted Caramel would be wonderful. Thank you! Sicilian Hazelnut & Almond sounds delicious. Would be interesting to try the different flavours. Chocolate with coconut and caramel. Any except salt which just seems wrong on chocolate. Ah, but have you tried it Alan? Dark chocolate, date and pecan. Anything with chocolate in it! I love them all!!! Where is the Gleam widget? Just click on the link at the bottom of the page Anthea. Anything with chocolate is alright by me! Fab prize! I love the packaging.